Mish's Global Economic Trend Analysis: Sudden Belief in Abenomics; Bets on Yen Hit Three-Year High; Yen a "Safe Haven"? Sudden Belief in Abenomics; Bets on Yen Hit Three-Year High; Yen a "Safe Haven"? Traders are increasingly betting that Japanese prime minister Shinzō Abe will not follow through on his plans to do whatever it takes to defeat deflation in Japan (or that he has already done enough and won't do any more). Currency futures show Bets on Yen Strength Climb to Three-Year High. Bets the yen will strengthen climbed to the highest level in three years as concern global growth is slowing spurred demand for the relative safety of Japan’s currency. Hedge funds and other large speculators boosted net long positions on the yen to 25,266 contracts in the week through Jan. 12, the most since October 2012, based on futures. Japan’s currency rose to the strongest since August versus the dollar last week as a slump in stocks around the world and signs China’s economy is losing momentum pushed back expectations for the Federal Reserve’s next interest-rate increase. 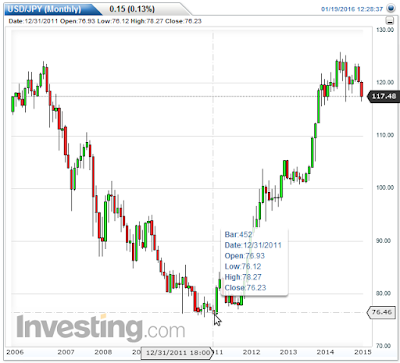 At the start of 2012 the Yen traded at 76.23 to the dollar. It's now at 117.48 to the dollar. That's a decline of 35%. In May, the Yen hit a low of 125.86 to the dollar. Since then, sentiment on the Yen switched wildly as shown by currency bets. On December 8, the Financial Times reported Japan GDP Revised From Recession to Growth in Q3. Growth for the third quarter was revised on Tuesday from an annualised fall of 0.8 per cent to an annualised rise of 1 per cent, erasing the technical “recession” declared just three weeks ago. Investment was the main force behind the revisions: it was amended from a quarter on quarter fall of 1.3 per cent to a rise of 0.6 per cent. Instead of subtracting 0.7 percentage points from annualised growth, therefore, it added 0.3 percentage points. 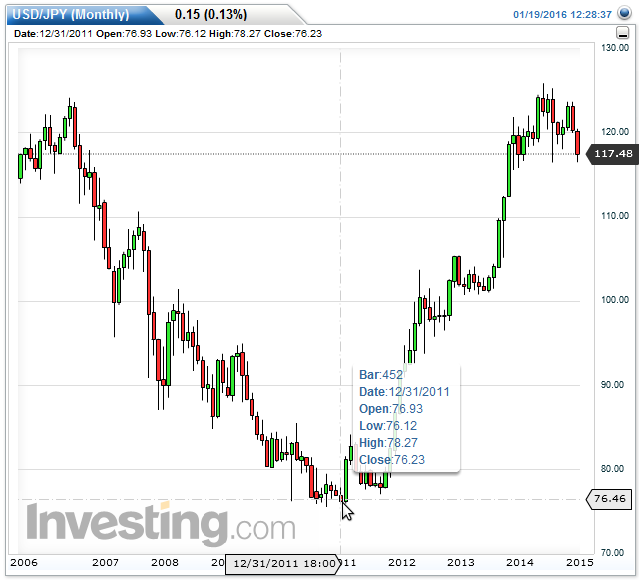 Is the Yen now a safe haven? Apparently traders think so. I don't. Japan will not decouple from the global economy. And on the next downturn in Japan, Abe is likely to try anything. In the meantime, as long as Abe does not see need for further stimulus, the Yen may have further to run. With all the currency traders suddenly believing in Abenomics, a swing back to the other side could produce significant currency moves the other way.